Dal blog di Ciro Discepolo: "fra meno di un mese sarà pubblicato un altro mio libro, Relocating Solar Returns, scritto a quattro mani con il bravissimo Luciano Drusetta e con un capitolo, in Appendice, di Margherita Fiorello. I lettori USA, ma anche quelli Inglesi, Canadesi, Australiani, Europei, Russi, ecc. stanno molto apprezzando questi libri e li comprano prim'ancora che appaia una recensione o la possibilità di leggere un capitolo interno. Questa è la più grande soddisfazione della mia vita. Diversi lettori stranieri mi dicono già di possedere tutti i miei libri in lingua inglese." I am the translator of Ciro Discepolo’s entire works in English. I have also translated some of his works in Spanish. Italian is my native tongue, and I typically translate texts from English, French, Spanish, and Hungarian to Italian. My translations of André Barbault’s articles from French to Italian are favourably considered here in Italy. There is a severe discussion here in Italy on the topic of “the right place for casting a chart of Solar Return”. Important astrologers believe that the chart of Solar Return must not be cast for the place where you are at that moment. They cast it for your birthplace or for the place where you have your current residence instead, thus excluding any possibility of relocation. It is my belief that this discussion involves mainly, if not exclusively, Italian astrologers. 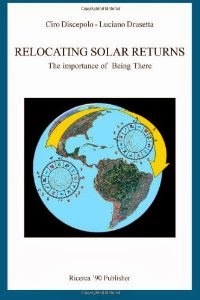 To my best knowledge, the technique of relocating the Solar Returns is widely accepted and commonly put into practice by astrologers all around the world. [...] Thus, I have organized my chapters as a roundup on different techniques – including those not belonging to Discepolo’s school of Active Astrology. I have tried to focus on one essential and philosophical point, which is the importance of time and space in Astrology. [...] I am confident that you will find my chapters a pleasant reading above all. You may also hopefully appreciate some bits of astrological advice in my pages, especially when I disclose to you some episodes from my personal practice of counselling. Please let me express my gratefulness to my master, Ciro Discepolo, for offering to me the opportunity of publishing my thoughts and beliefs in this volume. I would also like to thank my wife for her patience in allowing me to spend several hours at the computer – not all of those hours have been really productive ones, though. Still, her unobtrusive interest in my intellectual production has been of fundamental importance, spurring me to finish it in due time despite all my lazing about on the social networks. I know that beside any other woman, my personal contribution to this volume would have never seen the light.